Visitor Badges with Registry Log. Keep track of visitors in your facility with one convenient book. When the badge is filled out, the visitor names are entered in registry book, providing a written record of their visit to your facility. Each book contains 150 self-adhesive visitor badges. Carbonless copy of each badge is kept in registry book for reference. Store completed registry book when all badges are used. Hi, I'm Griffin at C-Line, and today we're going to talk about our Visitor Badges with Registry Log. The registry log comes complete with 150 visitor badges that allow you to keep track of visitors and manage traffic in your facility with one convenient book. To use, simply insert the transfer shield over the next sheet of badges. When guests enter your building, fill out a visitor badge in the logbook using a ballpoint pen. Remember to press firmly when writing. The visitor badge includes their name, company, date, and time. Next, remove the peel-and-stick visitor badge from the logbook and apply to clothing, leaving behind a carbonless copy for future reference. Once all the badges have been used, the registry log can be stored away for future reference as needed. There's a convenient spot on the front cover to log book number, start date, and end date. 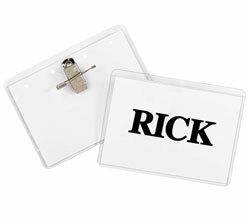 C-Line visitor badges with registry log lets you keep track of visitors, monitor traffic, identify unregistered personnel, and retain a permanent record of guests at your facility. They're great for events, schools, businesses, and more. Order yours now! That's all we have for today. I'm Griffin at C-Line and thanks for watching.